Product code: ES8044 Categories: Sold Items, Sold Jewellery, Sold Rings. Here is a very elegant hand made 18 carat yellow gold antique sapphire and diamond engagement ring that was made in 1901 and looks as beautiful today as when it was made well over 100 years ago. The design is so elegant and will always be admired on the hand and is set with a beautiful natural blue sapphire in the centre that has such a beautiful royal blue colour. Measuring 0.38 carats on each side is a diamond to add to the sparkle and romance and these diamonds total 0.54 carats. Both the sapphire and the diamonds are claw set allowing the maximum amount of light to enter all the stones and really showcase their quality. At the centre the ring measures 5.2mm wide by 13mm across and leads to a very elegant half round band that feels so sleek to the touch. This is such a beautiful and elegant example of an antique sapphire and diamond ring that looked beautiful when it was made, looks stunning today and will continue to do so well into the future. Tag: Antique sapphire and diamond engagement ring. 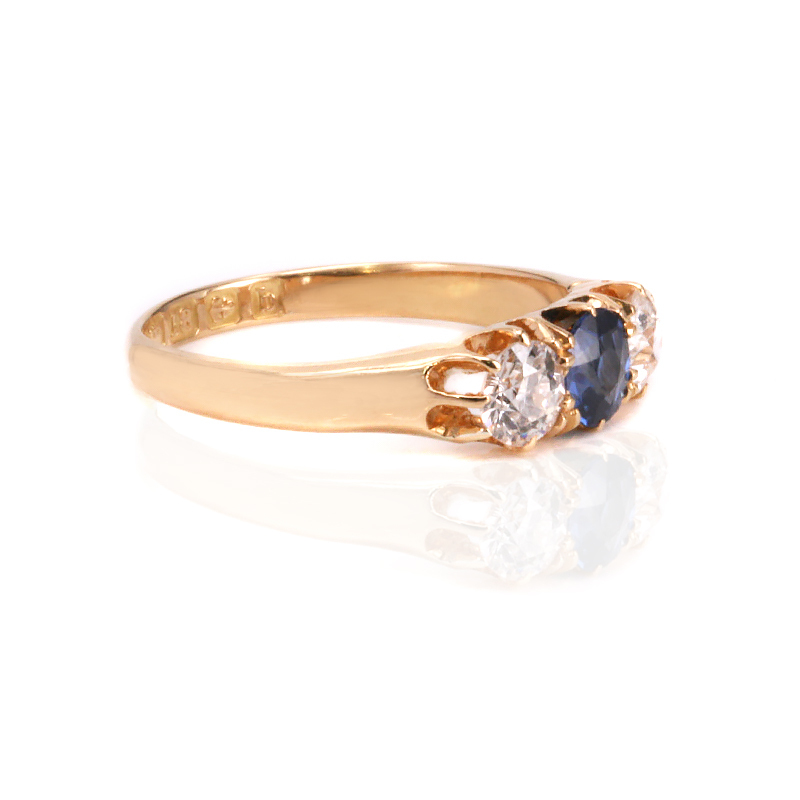 This antique sapphire and diamond engagement ring was made in the Edwardian era. 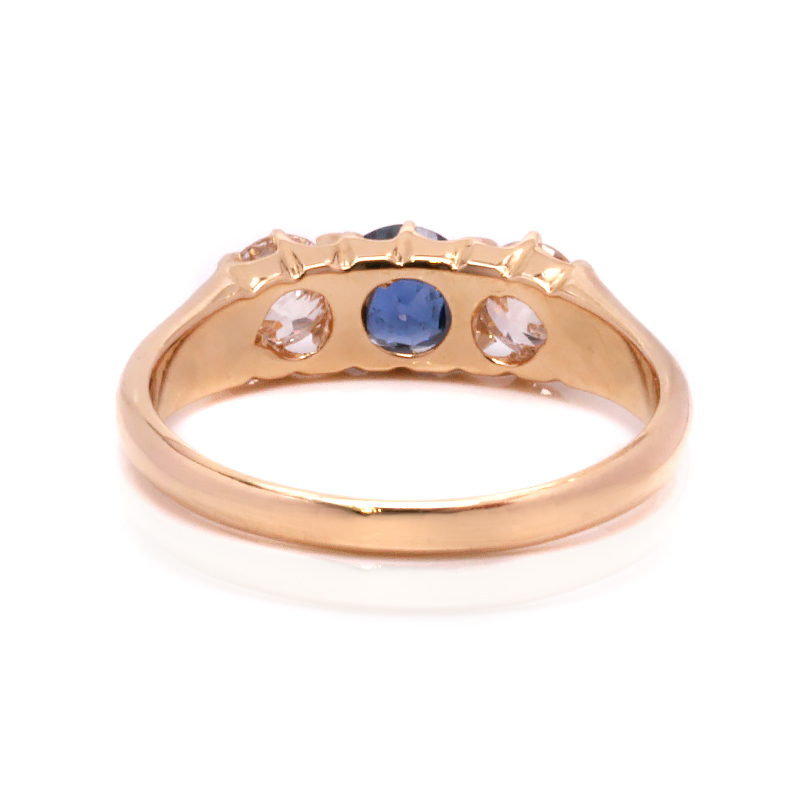 Hand made in 18 carat yellow gold, it is set with a natural sapphire in the middle and two diamonds on each side. A traditionally designed ring, this sapphire and diamond engagement ring will always be admired.